This seems to be a very nice way to share those past twelve months of photographic adventures with all our friends, followers and supporters. Therefore I also decided to point out 12 images, one for each month, which I feel very good about. Most of them are already online and you may have come them across on our stock website but even if so, I reckon these frames deserve to be showcased again. In January I had some great times with my models on Franz Josef Glacier. It is not common to be able to walk through this deep ice crevasses but on this occasion, we were very lucky to be here. 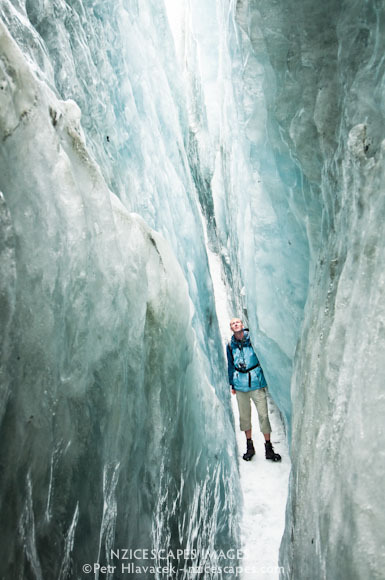 Actually, this has been the deepest crevasse I’ve ever walked through. It might have been 15-20m deep at places and possibly 100m long. It was absolutely amazing and my massive and grateful THANK YOU goes to the Glacier Guides from Franz Josef, who made this possible! It wasn’t easy to pick my favourite shot as the ice colours and patterns were changing along the way but this image has a great combination of being lost amidst the ice and “Alice in the Wonderland” feeling. Totally surreal place to be in! 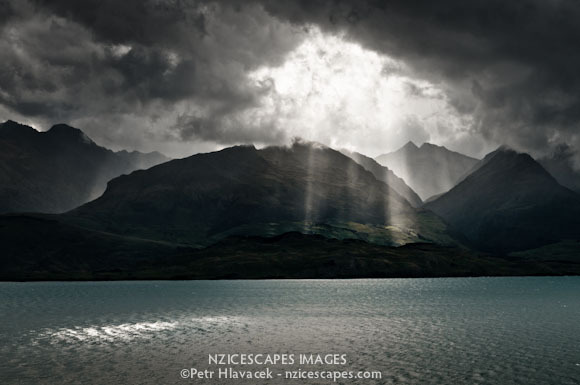 In February, on one late afternoon I drove from Wanaka toward the West Coast. It was very dull and the sky was heavily clouded with no light at all and it started to rain slowly, intensifying into downpour. It felt like you were under some dark blanket. Except for one moment when a sudden burst of light broke through the black clouds. Luckily I was able to grab this image before it started to bucket down again. In March I had my friend, a fellow photographer over to visit and we decided to take a heli ride over the glaciers in Westland NP. With doors off, we spent nearly an hour of the golden hour of the day flying over the Southern Alps and making images. For this image in the upper parts of the Fox Glacier I asked pilot if he could get as low and as close to these crevasses as he could, so I could emphasize them. They remind me of fingers pointing to the second highest mountain in NZ – Mt. Tasman 3497m which dominates the background. The orangy colours are partially from setting sun but they’re also enhanced by the dust which by the end of summer reaches NZ from Australian outback. April was an exciting month, as I was able to visit one of the locations I’ve been having on my list for many years – the Ice Lake. This lake is hidden behind ranges only a few km away from my home and is an absolute gem. It is also very difficult to photograph since the lake sits in between high ranges so not much light gets there and one faces a massive exposure differences. In this image I didn’t have many options but HDR. Frankly, I’m just starting to learn a little about HDR as I’m not a huge fan but do understand its benefits, which I appreciated in creating this image. May, that’s when the winter starts kicking in. And winter on the West Coast is just magnificent. Brilliant skies and best light. I love going on the glacier in winter because you get all sorts of frozen patterns in puddles made by melting water from the sunny days. 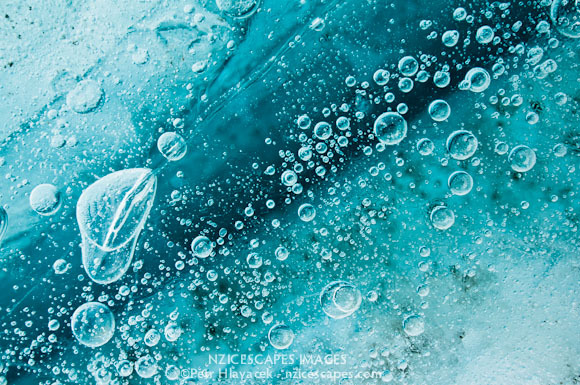 One of great example is here – frozen air bubbles in a small crack in the ice filled with water. Unfortunately, the limited colour space of your screen doesn’t show you the real colours of this image but just imagine intense blue-turquoise hues. Love it! In June I visited another of my favourite locations – The Castle Rock Hut. 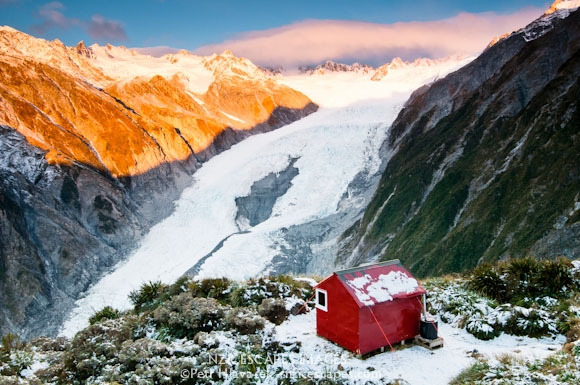 This hut is perched on the ridge overlooking Franz Josef Glacier with some spectacular views. Can’t wait to go back! 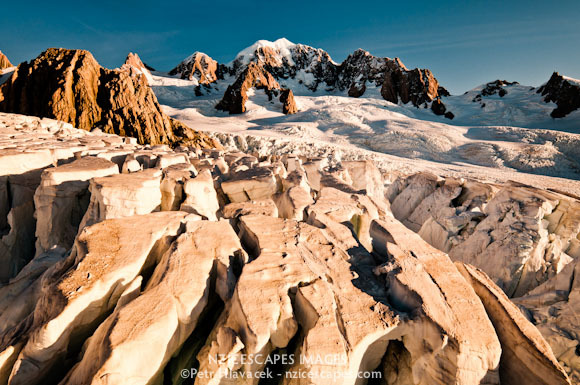 July was again – the glacier time. With fresh blanket of snow, everything looks so pristine and pure. Then all it takes is to walk and walk and walk around very carefully, looking for some nice frame to make an image. And if the sun and caves works together, some great images are to be had. Using a small aperture gives you this nice starburst effect, which ultimately makes the image shine. There is still plenty of snow on the mountains in August and it’s a great time to get some fantastic imagery done. This image was made on the Gillespies Beach with reflections of highest NZ mountains – Mt. Cook (3754m) right and Mt. Tasman (3497m) left. The Tasman Sea is just a few meters behind my back so one has to watch ones back if the tide is high. In September I was working on assignment to get the panorama of the Southern Alps with as little shadows as possible – sometime you have to listen to your client. Despite that brief, the image turned out quite nicely. We waited several days for some fresh snow to dust up the already warming mountains and that’s why I picked this image for this month, as it shows gently snow covered mountains with a lot of detail and all the beauty of Fox Glacier sliding down through the middle of the frame. October was month of sunsets. 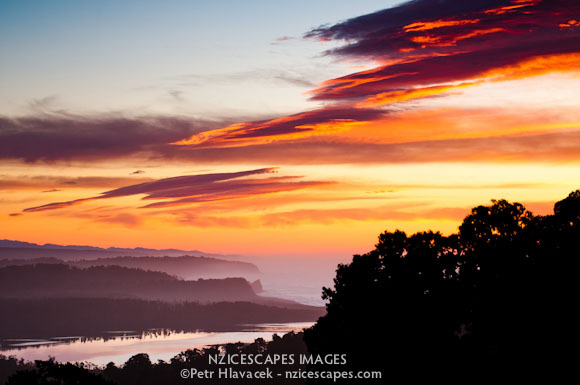 One of these has been taken from Okarito lookout. Image overlooks the Three Mile Lagoon and leads your eye further along the coast south. Great skies made the frame. 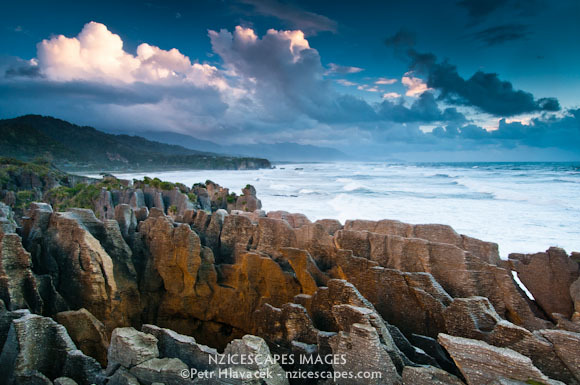 In November I travelled a little north along the West Coast, to Punakaiki. This great location is famous for its “Pancake Rocks” and fabulous coastline. This image has quite common and popular framing of the location but despite that I pick this image because I like the light and sky in it. It’s been very windy evening and clouds were chasing each other and when the sun sinked below the horizon, it threw its last rays onto those clouds and gave us one more opportunity to make an image. Lastly, in December I went with my friend for several days into the wilderness. We hiked toward the Copland Pass in the Southern Alps and needless to say, the trip was just brilliant. Not only we had a great swim in freezing cold waters of Copland River on scorchingly hot day but we came home with some great imagery, as well. One of my favourite frames from the trip is this panorama of the Copland River. This entry was posted on 29/12/2011. 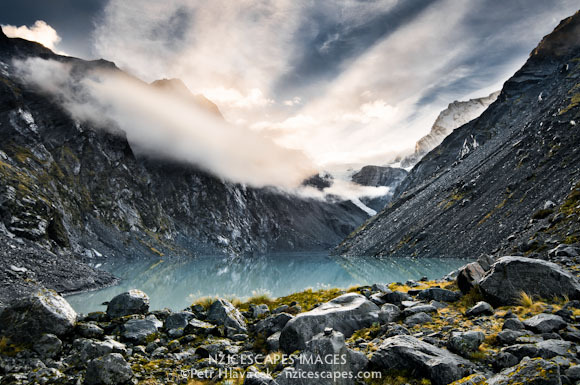 It was filed under Photography, Uncategorized and was tagged with adventure, Franz Josef Glacier, glacier, mountains, photography, The Southern Alps, West Coast, Westland NP. Yes, I'd like to subscribe to your newsletter! For this poster collection, we have selected a wide range of West Coast images for the production of high quality but affordable posters. These posters are individually printed to order and are not to be confused with mass-printed poster production. Beaten views are sometimes worth it! All images Copyright © 2015 Petr Hlavacek. Unauthorized usage of the images and content of this website is strictly prohibited. 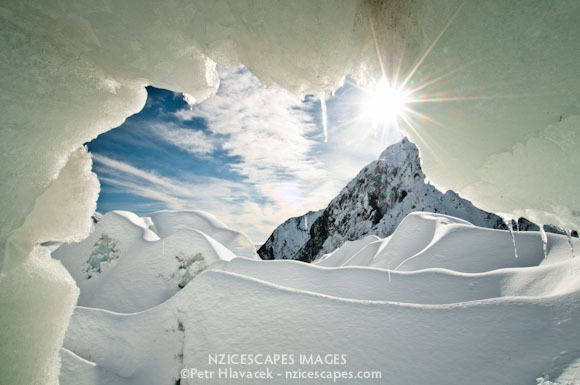 NZICESCAPES IMAGES and Petr Hlavacek Gallery is privileged to be based in one of the most spectacular parts of the world, in the small village of Whataroa, in the Glacier Country on the West Coast of the Southern Alps in New Zealand.